A sixteenth century crossbow was amazingly heavy. Rabbit fur blankets are made from strips of fur bound together on a loom. Turkey feather blankets are made in a similar fashion. Both are as warm as modern down coats. To use a chest crutch, you need to punch, not just push. Pueblo pottery from between 1325 and 1700 can be accurately typed and dated by rims. An expert can tell blindfolded with just a fragment when a piece was made. Yucca fiber can be used to spin a very strong cord. The historic pueblo of Mojo is quite likely located right off Coors Road in Albuquerque. If you’re going to open-fire pottery, you need at least a breeze or the fire won’t get hot enough. These and other marvelous bits of information were among the things I learned this past Sunday when I attended the “Chiles and Sherds” archeological event hosted by the Office of Archeological Studies (OAS) of the Museum of New Mexico. “Chiles and Sherds” is OAS’s annual fund-raiser and educational event. 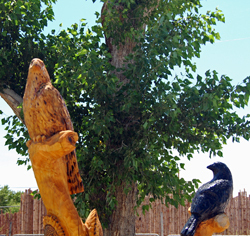 The venue changes from year to year, but the event’s emphasis is always some aspect of New Mexico’s rich archeological tradition. This year, the location was the lovely Albuquerque Open Spaces Visitor Center on the west side of the city. Tucked between Coor’s Road and the bosque (river forest), the Open Space’s Center is an oasis of quiet – a real jewel that I can’t decide whether I wish more people knew about or that I want to keep a secret. Just north of the center, on land owned by the City of Albuquerque, are the ruins of an adobe pueblo that was occupied roughly between 1300 and 1600. Thousands of local residents drive by it each day, unaware that what looks like gently rising and falling ground (you can’t even really call what’s there “hills”) is shaped the way it is because below the surface are the remains of plazas, middens, and thousands of rooms. Exactly which pueblo this was is open to debate. In fact, several of the talks given during “Chiles and Sherds” explored the evidence for and against this being Mojo – a pueblo that Coronado besieged for months, and where several pitched battles were fought. But I don’t want to give the impression that this was a dry academic event. Far from it! Remember those crossbows I mentioned? In honor of one of the Coronado Expedition’s most popular weapons, a hobbyist named Don Menning very kindly brought along a part of his collection of crossbows, including a couple of accurate replicas of the bows Coronado’s men would have carried. Perhaps I should say “hauled.” When Don insisted I pick up one of the replicas, I was staggered – literally – by the weight. I don’t usually consider myself a wimp. I carry twenty-five pound bags of guinea pig chow around with ease. These, however, must have weighed nearly twice that. The bow section was made of thick steel, so was the mechanism. The wooden stock was a solid chuck of wood. The cord used for the winding was twice the diameter of my clothesline. According to Don, the quarrels (that’s the proper term for a crossbow arrow) with their folded metal tips would have weighed about a pound apiece. A solider going into battle would have carried about twenty of these – in addition to the bow, in addition to the heavy winding mechanism, in addition to the weight of his steel breast and back plates, and steel helmet. The great advantage of a crossbow over a long bow was the time it took to learn to use one effectively. Long bows – especially of the size and weight used to punch through armor – take a lifetime to master. Within a week or two, a solider could be trained to arm and point a crossbow – the bow’s mechanism provided the punch and carrying power. No wonder the Indians residing along the bosque when Coronado’s forces came riding through were overwhelmed. Their armaments included bows, however, these weren’t the great English longbow. They were shorter bows, meant for hunting rabbits, squirrels, water fowl, and the occasional deer. Of course I couldn’t shoot the crossbow – no one did, given that these have enough power to punch through a steel plate or a modern wall. However, Don very kindly let me shoot a light-weight replica of a Chinese repeating crossbow. If I ever write a fourth book in the “Breaking the Wall” series, you can count on these showing up! It was really neat. After playing with the crossbows, it was inevitable that between tours (I was volunteering as a supporting guide), I would find my way out to the range where you could try an atlatl or bow. I’ve used an atlatl (often called a “spear thrower”) before, but it’s been years since I fired a bow. When I was a kid, I worked out how to make bows, starting with twigs and bits of grass, graduating up to something like a crude short bow. However, I never studied archery and my mostly city life hasn’t exactly provided room for flinging projectiles around. Meanwhile, Jim was demonstrating not only traditional flintknapping, but how a device called a “chest crutch” could be used to knock longer blades off a chunk of obsidian. These blades provided the sharp cutting edges of the macanas, a sort of hybrid sword/ club that was the principle melee weapon used by Coronado’s indigenous allies. The “chile” part of “Chiles and Sherds” is a high-class catered lunch. This one was fantastic, even better for being served on a perfect autumn day under a tent in good company. That sense of good company continued throughout the day. Eventually, Ulysses the potter took a break and wandered over to sit with Jim and discuss flintknapping. Various experts and enthusiastic amateurs engaged in a vivid cross-fertilization of ideas and theories. Autumn, New Mexico style, is upon us. That means nights dropping into the mid to low sixties (we’ve had a few in the fifties) and days that still reach into the nineties. Leaves on trees are still green. Globe mallow is blossoming in high stands with tiny orange flowers. Wild asters are waist-high purple. Sunflowers of various types contribute brilliant yellow. Looking over what I’ve cooked the last week or so, I realized how coping with the garden has also contributed a very international flavor to our meals. In addition to adding them to salads, I like to serve cucumbers after a style a Chinese friend introduced me to: sliced, then seasoned lightly with soy sauce and sesame oil. Sometimes I add chives. I also make a variety of Indian raita: yogurt, green chile, cilantro, mint, topped with toasted cumin and mustard seeds. One thing I want to try before the summer is over is a French cold cucumber soup, seasoned with dill. Zucchini is often the base for stir fry, augmented by whatever else the garden is doing in quantities. Earlier in the season, that was beans and eggplants. Now beans have faded out and peppers are entering the mix. I also make calabazitas, a New Mexican dish in which the squash is blended with sweet corns, then seasoned with onions, garlic, green chile. My recipe calls for it to be topped with sharp cheese. Tomatoes… Well, for someone raised by a mother sincerely rooted in the Italian-American tradition, you can never have too many tomatoes. One of my favorite ways to serve them is in a salad with fresh basil, arugula, olive oil, and sliced garlic. I also make a variety of tomato sauces. And, of course, freeze tomatoes for winter cooking. When I do this last, I drain off the excess liquid and save that to augment homemade chicken soup. I make a hot/sweet variation of my grandmother’s green tomato relish, substituting jalapeos for green peppers. I dry herbs. (Drying is almost too easy in New Mexico). I make pesto. As I go about gathering and preparing, I feel a singular kinship with squirrels. I like living with the seasons. When hard frost takes out the garden, we’ll eat the tomatoes that we can ripen indoors, then that’s it. No more fresh tomatoes until next July. The same with many of the other veggies. If I haven’t put it up, I don’t buy it. We start buying lettuce again. I bake more. My selection of recipes changes. We don’t winter garden, except for a few herbs. It’s nice to give both the earth and ourselves a rest until early spring when we start thinking about seedlings. There’s a freshness to the turning of the years, a connectedness to the cycle of the living world. I like it. Like the world around me, I thrive. “Wow” was the word for the day. This past Sunday, Jim and I went to the New Mexico State Fair with our friends Chip Wideman and Michael Wester. Jim and I always try to go to the Fair at least twice. Usually, one of those trips is with Chip. This year was our first with Michael and he proved to be a very pleasant addition. We arrived shortly after opening. Lines were light, so, without much delay, we found ourselves descending into the tunnel that goes under part of the racetrack. From there we climbed up the steep, shadowed passage. Like four heroes out of some legend, we emerged into a world completely different from the one we had left behind. Really, there is something extraordinary about the State Fair. I think that’s why it gets cameos in various of my works, including Child of a Rainless Year. The New Mexico State Fair is built around traditional events. Yes, there is a midway featuring bright, gut-twisting rides and games whose prizes celebrate the latest trends in pop culture. (This year there didn’t appear to be any one dominating theme, although Sonic the Hedgehog in gold metallic fabric was popular, as were pillows and teddy bears made from fabric embellished with dollar bills). However, the Midway is set up off on the southern edge of the Fairgrounds. If you turn north, as we did, you could almost believe you were attending a state fair from the days of yore. After weaving our way through the Food Court, we sauntered down the Avenue of the Governors toward the Poultry/Rabbit Barn. The crowing of a selection of roosters greeted us as we entered, but what caught our attention right off were four wire enclosures whose inhabitants were sitting very, very still. 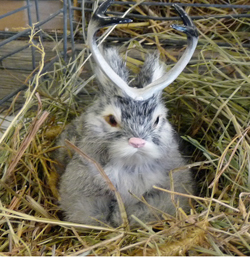 On closer inspection, these proved to be four jackalopes, submitted by a local wit. Greatly cheered, we moved on to the reason this had been our first destination: the guinea pigs. If you’ve been reading between the lines on these wanderings, you will have noted that Jim and I share our home with several guinea pigs (or cavies, as they are known elsewhere in the English-speaking world). We hadn’t entered ours in the show, but we always enjoy seeing the entries. This year was dominated by smoothed-haired varieties, including some enormous males. After assessing the guinea pigs, we went on to check out the rabbits and poultry. Among the highlights were some amazing ducks about the size of your standard white “Peking” duck, but all-over feathered in the same hue of green more familiar to me from the heads of male mallards. There were many rabbits. I have a weakness for the exotic coat colors, while Jim likes the dwarf lop-ears. Lastly, there was one of those perfect State Fair Moments, when we waited while a lady took out a black dwarf bunny named Cookie so two toddlers could find out just how soft a real bunny could be. We moved on from there to the larger livestock. There wasn’t a show going on at that moment in the Horse Complex, but the Dairy Barn was quite active. I’m not quite sure what the event for the day was, but there were quite a lot of young people escorting around newly shaved black-faced, black-legged (but otherwise the usual snowy white) sheep. Although the day was warming, a good number of the sheep waiting to go on-stage were wearing leotards to protect them against the morning chill. Yes. You read that right. Although many wore a more usual blanket, there were sheep that had been fitted into human-style leotards. Some years you can tell what fad is going out by the patterns (I think they buy on-sale), but this year we mostly saw solids. Still, seeing sheep in leotards is pretty weird, no matter the fabric. We inspected the cattle, mostly black Angus, but some dairy. Then we went into the Sheep to Shawl exhibit. This is a really nifty program in which you can see everything from a sheep being sheared to wool being washed, spun, carded, dyed, and, of course, woven. They usually have several looms going, and this year we had a nice chat with a woman about the problems generated when ninety feet of thread isn’t strung quite tightly enough. In the attached shop, Jim bought himself some hand-made fingerless gloves for the field and me a sorceress figure from handmade felt, with elaborate hair in different textures of wool. We decided we needed to eat and trooped back to the food court where Jim got a Philly sandwich and an enormous boat of fries (which we all shared). The rest of us had gyros. Michael tried his embellished with green chile and seemed to approve. (Yes. “Chile” is the correct spelling of the word that means “hot peppers” here in New Mexico). After, we strolled by one of the stages, pausing to watch some children ages six to about twelve do some amazing jump rope demonstrations. On the Avenue of the Governors, there was a Chinese acrobat troupe doing weapons demonstrations and lion dances. These were neat, but we wanted to get back to the more traditional displays. Our next stop was the Agriculture Building. There, we carefully reviewed all the fruit and veggies on display. The giant pumpkins and sunflower heads were a hit, as always, but this year Jim and I were particularly wowed by some enormous Armenian cucumbers (the same variety we’re growing). I’m not exaggerating when I say that one in particular could have been hollowed out into a canoe large enough to hold Barbie and all her friends. We said “wow” a lot. We sampled salsa, beef jerky with red chile, peanut brittle with green chile. We watched the kids rolling around in a “sandbox” filled with corn kernels. My fingers are getting tired and I’ve missed a bunch of delights: the three arts shows, the hobby building, the Indian Village, the Floral Arts show. We’re going back to the Fair later this week. Let me know if you want me to take you along. I’d also love to know if any of you have a state or country fair near you and, if so, what it’s like. Okay, folks. Here’s another wander through Bubonicon 2010. This time I’m going to focus on two events I particularly enjoyed: first, a panel discussion on writers who game; second an event I think might be unique to Bubonicon, the Author’s Tea. As I mentioned last time, New Mexico is home to a surprisingly large number of professional science fiction and fantasy writers. A rather large number of these writers are also, or have been, gamers. When I use the term “gamer,” I’m using it in the specialized sense of someone who plays role-playing games – not board games or military strategy re-creations, but the sort of games where you sit down and, abiding by an agreed-upon set of rules, play at being something you’re not. It’s a hobby that suits many writers very well. My panel members included Melinda Snodgrass, Daniel Abraham, Walter Jon Williams, Carrie Vaughn, and myself. I should note that this barely dabbled a toe in the writer/gamers who attend Bubonicon. Others include John Jos. Miller, Ian Tregallis, Pati Nagle, George R.R. Martin, Laura Mixon, Steve Gould, and others I’m probably forgetting now. If you notice a certain overlap with the Wild Cards shared-world series, well, this isn’t a coincidence, but they tell their own story well enough elsewhere. We started off sounding rather like an A.A. meeting: “Hi. My name is X. I’m a writer and I’ve been gaming for X years.” Then with a roll of the dice (hey, I was the moderator and I could if I wanted), we went on to discuss how writing has colored our gaming and gaming our writing. Walter talked about how the “Rome Game,” which was set in the dying days of the Roman Republic, influenced both the political design and a few of the characters for his “Dread Empire Falls” series. Walter was careful to stress that he did not transcribe the game, but that the theme of a great empire committing suicide from within fascinated him. Melinda Snodgrass took the other direction, noting that Richard Oort, the protagonist in her “Edge” series, was a favorite gaming character of hers. (I certainly knew this, having played with Richard in at least three different incarnations: cops, FBI, and space opera). Melinda went on to explain how as much as she enjoyed playing Richard, she never felt she was able to investigate his “back story” as much as she would have liked. As a good gamer, Melinda understood that gaming is an interactive process. Sitting around brooding about one’s past is not exactly conducive to making the other players enjoy your company. The novels, however, gave her the opportunity she had desired. Daniel Abraham, in neat contradiction to the theme that it’s never a good idea to think you can transcribe your game into fiction, went on to discuss a sold (but as yet unpublished) project on which he is collaborating. This space adventure will use not only the reams and reams of background material that Daniel’s collaborator developed, but also some of the characters and adventures. Daniel stressed that while they’re using the material, they’re adapting it heavily. Carrie also weighed in with a reminder that most magazines warn against the gamer’s fond belief that a simple transcription of your latest adventure will make a story of interest to anyone other than the gamers involved. I’m going to stop here, because I want to also talk about the Author’s Tea. The Author’s Tea, as our listing in the program book states, is not tea for the authors, it’s a tea with the authors as hosts. Those of us who put it on take that hosting seriously. Many of the food items – sweets, breads, and savories – are cooked by the authors. Four teas are offered – each year one classic black, one spiced black, one green, and one tisane – all brewed on the spot. The idea for the Author’s Tea came some years ago when the writers on the first panel of the morning decided to bring refreshments for those who staggered out of bed to attend. This evolved into a formal afternoon English High Tea. What we do is take over the Con Suite and the room across the hall and turn them into a Tea Room. In addition to the above mentioned food, there is a hats and gloves contest, with prizes for categories ranging from “Most Creative” to “Most Elegant.” This year’s judge was writer/artist Betsy James. We also have a drawing for signed books. I’ve been saying “we” here, but it’s only polite to note that the coordinator of this event, the person without which it never would have gotten started, and the one who keeps it going, is Pati Nagle (who also writes as P.G. Nagle). Pati selects the teas. She makes up the pretty signs and keeps the boxes of gear in her garage. She makes the world’s best cream scones with currents. Since I’m her Official Second in Command, I can state most cheerfully that Pati needs me like she needs a second head. (Her first is well-balanced and creative enough). This past weekend I attended our local Science Fiction and Fantasy convention, Bubonicon. My convention started with Jim and me arriving in time to grab our badges and head for the Opening Ceremonies. This is a very informal gathering that mostly serves to let everyone know the ground rules and to introduce the special guests. (This year they were writer Peter David, artist Sarah Clemens, and Toastmaster Mario Acevdo). My reading was immediately after the Opening Ceremonies so, as soon as they ended, I dove out the door and trotted to where I thought I was supposed to go. Except I was wrong… We then set out to find the Vista Norte room. Suddenly, I understood the warnings that had been dotted throughout Opening Ceremonies and had been hinted at by the condition of the parking area. The hotel wasn’t just undergoing renovation… It was nearly a wreck. Finding the Vista Norte room turned out to involve going across the entire hotel, going past the registration desk, around a sharp bend, through a door usually closed, and into a narrow corridor (usually part of the food preparation area for the restaurant). This corridor was completely sealed off with taped-up sheets of black plastic, which made it really eerie. Then we emerged in the foyer leading into what was normally a nice meeting room off the restaurant. However, with the corridor outside stripped to bare concrete, I had the feeling I was dodging into a furnished cave from the wilds. Despite all this (and probably because Jim stood at the end of the corridor by the sharp bend and pointed people where they should go), I had a great turnout for my reading. In as many accents as I could muster, I read “The Drifter,” my 9,000 word contribution to the anthology A Girl’s Guide to Guns and Monsters. This panel was also influenced by our hotel’s erratic hospitality. The room was freezing cold! So much so that my hands were actually trembling – and I was wearing a long-sleeved denim coat over my tee shirt and jeans. However, there’s nothing like adversity to bond strangers and soon the panelists (which included Carrie Vaughn, Peter David, Suzy McKee Charnas, and Susan Krinard) warmed up the room with a heated discussion. About half-way into our fifty minutes, a quiet man with an Allen wrench and wisdom beyond mortals came in and adjusted the temperature. Thus we were saved from hypothermia. That ended my formal programming for the day, but began what’s my favorite part of conventions: catching up with friends – some of whom I didn’t know before that particular day. I have a confession to make. I’m not a really good “power-networker.” I know writers who go to conventions specifically to butter up someone they think will do them good in the future. These people end up in some room party or at a table in the bar, trying to say all the right things, laughing hard at bad jokes, or otherwise doing whatever it is they think will advance their career by making them popular with the Big Shot of the Moment. I’ve never managed this. What I like is visiting. These visits may be with other writers (New Mexico has a disproportionately high number of professional SF/F writers), but they also may be with “just” a fan. I’ve been attending Bubonicon most years since 1994 and many of the regular attendees are people I’ve enjoyed getting to know over the years. But I like meeting people I’ve never met before. No. They don’t have to have read anything I wrote. They might be Kit, the cute young lady dressed very convincingly as a sort of steampunk Oliver Twist. (She looked about ten, but when you talked to her she was clearly all of her nineteen years.) Or the friend of a friend who hadn’t been to a Bubonicon since he’d been the age of twelve and was now returning with a whole new perspective. And I’ll admit to a weakness for the young people I’ve had the pleasure of watching grow – not just up, but in complexity and ideas and goals. There are my Los Alamos girls – Tori, Melissa, Dominique, and Rowan. I met them first when they were fifteen, and they hold the unique place of being the first people I know of to come to an event to actually meet me. I’m glad I didn’t disappoint them, because I’ve really liked getting to know them better over the past ten years. There are Jennifer and Jacob from Portales, a brother and sister I first met waiting quietly in line for a costume contest display. They made such convincing Tolkienesque elves I had to stop and reassure myself that – even face to face, practically nose to nose – they weren’t the real thing. I’ve enjoyed watching them since. They often do “paired costumes.” As an anime fan, I was awed by their depiction (with the help of two friends) of Vash and associates from Trigun. Jacob’s depiction of Jareth the Goblin King from Labyrinth was great too. There’s Hilary. And Shannon. And the silent twins. And Amanda. Hmm… I’m running on. How about I continue this wandering next week? I can talk about tea. And authors who game… Yes. Why don’t I?